When considering your lighting application solution, it is prudent to educate yourself on the available lighting types on the market today. Given the recent surge of promotion and the popularity of LED lighting, many consumers assume LED to be the solve-all for every lighting application. Although LED technology meets and exceeds the standards for many applications, one should be careful when considering LED for applications where light projection or penetration is important; i.e. applications where the light source is mounted at long distances from the target, as in Street Lighting, High-bay Warehouse, Sports Arena, Airport and Greenhouse lighting for example. LED’s present many advantages over traditional light sources including lower energy consumption, longer lifetime, improved robustness, smaller size and faster switching. However, they are relatively expensive and require more precise current and heat management than traditional light sources. It should be noted that high-power (≥1W) LED’s are necessary for practical general lighting applications. Typical operating currents for these devices begin at 350 mA. One of the highest efficiency ratings of high-power white LED’s is claimed by Philips Lumileds Lighting Co., with a luminous efficacy of 115 lm/W (350 mA). Please note that these efficiencies are for the LED chip only, held at low temperature in a lab. In a lighting application, operating at higher temperature and with drive circuit losses, efficiencies are much lower. Independent testing of commercial LED lamps designed to replace incandescent or CFL lamps showed that average efficacy was about 31 lm/W in 2008 and tested performance ranged from 4 lm/W to 62 lm/W) compared with 100-116 lm/W of DHIDTM lighting systems. Solid state devices such as LED’s are subject to very limited wear and tear if operated at low currents and at low temperatures. Many of the LED’s produced in the 1970s and 1980s are still in service today. Typical lifetimes quoted are 25,000 to 100,000 hours but heat and current settings can extend or shorten this time significantly. As a leader and one source supplier of advanced lighting systems for commercial and industrial lighting applications, including DHIDTM and specific LED lighting products, Accendo Electronics has studied and field tested both LED and the next generation Digital Ballast powered HID (called Digital HIDTM or DHIDTM) technologies for applications requiring long light penetration and retained light quality over extended time periods. In our research, we uncovered key myths and facts about LED’s you should consider when deciding on your project lighting. Manufacturers claim mean time before failure (MTBF) ratings on LED’s to be 50,000 hours to 100,000 hours or more. Although in cases LED’s do meet these extended MTBF specifications, this number must be directly correlated to the LED application itself. Factors such as mounting distance, the lumens per Watt (lm/W) rating, and operating temperature all contribute to the reduction of the LED’s MTBF. Realistically, LED’s used for street lighting, or high-bay warehouse applications for example, may be considered to be failed at 30,000 hours or sooner due to the significant light diminishment incurred in the time stages of the LED’s operation. The most common symptom of LED (and diode laser) failure is the gradual lowering of light output and loss of efficiency. Sudden failures, although rare, can occur as well. Early red LED’s were notable for their short lifetime. With the development of high power LED’s, the devices are subjected to higher junction temperatures and higher current densities than traditional devices. This causes stress on the material and may cause early light output degradation. To quantitatively classify lifetime in a standardized manner it has been suggested to use the terms L75 and L50 which is the time it will take a given LED to reach 75% and 50% light output respectively. L50 is equivalent to the half-life of the LED. The LED light quality diminishes or dims over the operating lifetime of the LED bulb. This degradation in light should be considered when reviewing the MTBF of LED’s since the light emitted at the LED’s life start is not equal to the light emitted at the bulbs half-life or life-end. If the LED bulb cannot produce the light output originally specified, it is a form of failure. Over time, heat created by LED’s also has an adverse effect on the systems light quality and MTBF. Depending on the class of the LED bulb used, factors such as powder coating (filter) degradation and the material used to manufacture the LED lens, further add to the truism that LED’s do not necessarily meet their manufacturer’s specified MTBF ratings and lighting quality claims. DHIDTM equals or outperforms the longevity of LED in most industrial and commercial applications at lower costs. The integrated microprocessor of the DHIDTM doubles the life expectancy of the HID lamp by maintaining full level of illumination up to 28,000 – 30,000 hours. Studies have proven that DHIDTM used as a direct replacement and mounted at the same distance as the original HID lighting, outperforms LED in many quantifiable measurements of energy efficiency and light penetration. DHIDTM offers a market leading lumens per Watt rating of 114 lm/W – 118 lm/W (which is 25% – 30% above LED’s lm/W rating) and therefore delivers higher energy efficiency, greater light penetration, and quality light up until its 30,000 hours MTBF; and all for a fraction of the cost of LED. Our studies proved that LED’s are not well suited for projecting light efficiently at distances exceeding 15ft (4.5m approx.). For street lighting applications the high lumens per Watt rating of DHIDTM provides the best value delivering higher energy efficiency, greater light penetration, and quality of light over time. Industrial and commercial applications where useful light penetration would not exceed 7 – 8 meters such as commercial room lighting, exit signs, target illumination in retail stores and others. Flash lights, and other utility lighting. Instrument panel lights and other back lighting applications. Industrial and architectural back lighting, and other decorative applications. When selecting a lighting system, significant consideration should be given to the performance, cost, and life expectancy of both solutions. Given the poorer lumens per Watt rating, high initial expense and realistic wear data of LED’s, we determined the DHIDTM solution to be the better value. 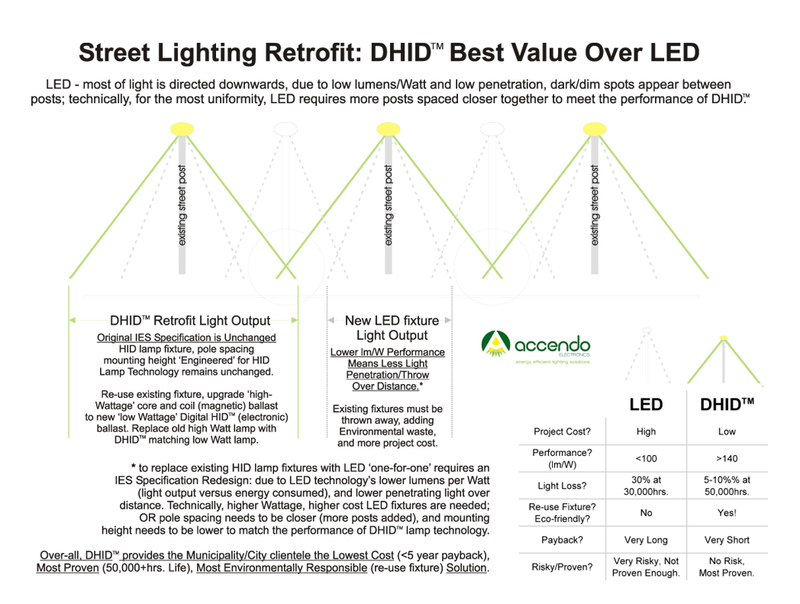 Progressively thinking end-users agree that DHIDTM is the more robust lighting solution with value added benefits not offered by LED; initial cost of investment, longer range of light penetration, and low maintenance costs were noted. With CMH or HPS lamps, the end-user can expect brighter light at the ground, with 30,000 hours of life expectancy and less than 5% degradation in light quality/brightness over the lifetime of the bulb. When a DHIDTM system CMH bulb fails, only the bulb itself needs to be replaced making it a most cost-effective alternative to expensive LED replacements. Maintenance and control of a DHIDTM lighting systems is further simplified by Accendo’s Light Control Software which provides real-time tracking and performance data of each DHIDTM light via radio frequency (RF) communication. Wall packs and canopy light fixtures (currently under development). Panel lights for architectural and special purpose lighting applications (currently under development). We welcome the opportunity to discuss our findings with you further. As confirmation of Accendo’s proven product specifications, Risk Free Trial units are now available for your own 30 day evaluation. Accendo Electronics is committed to the success of your lighting application; please do not hesitate to contact us for additional information today.